Later topic: What is the normal speed of a Heidelberg Windmill? 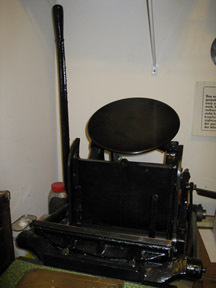 I have just purchased my first press: C+P 6x9 Pilot and will be driving 4 hrs to pick it up. I obviously don’t want to get there and be too surprised by it’s weight and size. What do I need to consider? I will have my husband with me, so I think between the two of us we should be able to lift it. My car is a Subaru Tribeca (back seats fold down) - should that do the trick? I will also have miscellaneous type drawers. Any advise would be helpful. Thanks. The Pilot is pretty heavy, but between the two of you it shouldn’t be too hard to get it in the back of the Subaru. But since you are driving a pretty good distance I would definitely suggest you secure it in some way. I had a rollover accident once and had a jack in the car which wasn’t secured and it went through the window pretty close to my head. That could have been bad! Also, don’t forget to take along a wrench and perhaps a heavy but soft-headed hammer (or a 2x4), because you’re probably going to want/need to take off the handle - it’s taller than you might think!. I carry a Pilot to shows twice a year in my minivan and the handle clears the back liftgate opening in the center but not at the side. If the press is on a table or stand and you can slide it directly from that into the back of your Subaru that works well, not so much actual lifting; use a piece of plywood to bridge the gap. I have a Sigwalt Ideal 6” x 9” and it is extremely heavy. Make sure you take some work gloves and maybe a strap to secure the handle. Congratulations on your new press!